At the request of the U.S. military, Eagle provides an all-wheel-drive Eagle USATS-6 Aircraft Towing (TT-6) and Eagle USATS-8 Aircraft Towing (TT-8). 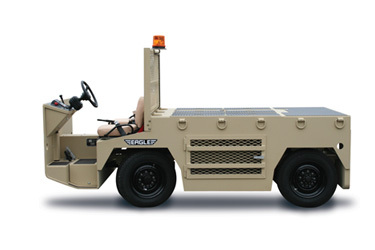 These USATS tugs include front operation seating for better control and visibility. Both of these military aircraft tugs are engineered to meet the standard requirements of today's military flight operations. Ideal for aircraft up to 58,000 lbs. on all surface conditions. Ideal for aircraft up to 51,000 lbs. on all surface conditions.